IAM Local 822 members in Quincy, IL are back on the job after a nearly two-week strike against employer Hollister-Whitney. 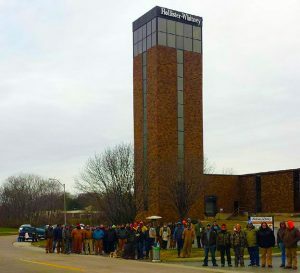 IAM Local 822 members in Quincy, IL are back on the job after a nearly two-week strike against Hollister-Whitney, an elevator parts company. The more than 240 members returned to work after voting in a new proposal Wednesday, December 14. The Machinists went on strike in early December after voting down the company’s proposal, which called for a six-year agreement, insufficient wage increases, a slow progression rate and high healthcare premiums. The final deal is a five-year agreement with a 2.5 percent yearly raise and a doubled progression rate of 50 cents every six months until they hit the top rate. The signing bonus was increased from $1,000 to $1,500 and workers will now have premium caps on their health care with no increase the first year, and an additional personal day. In addition, each worker will receive a Christmas bonus of $150 for each year of service by next week. The IAM has represented workers at Hollister-Whitney since the 1940s. This year’s strike was the first strike at the company since the late 1980s. The post Two Week Strike Ends in Victory for Illinois Hollister-Whitney Members appeared first on IAMAW.